Reduless: A natural yeast derivative for red or white wines. USE: To reduce suflur defects such as hydrogen sulfite. WHEN TO USE: As needed. Package Size: 30 grams (sufficient for 60 gallons). DOSE: For 60 gallons: Mix 30 grams with 11 ounces water or juice. Mix well and rack after one week. For 30 gallons: Mix 15 grams with 6 ounces water or juice. Mix well and rack after one week. 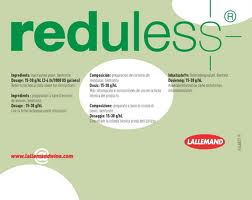 Reduless is a new organic proprietary formulation of inactivated yeast developed to improve the overall quality of both red and white wines. Its formulation is naturally rich in copper making it a usefull option to decrease H2S dimethyl sulfide and other sulfur defects. Reduless helps increase mouthfeel and can decrease phenol related defects. Grape varieties prone to negative sulfur compounds (such as Syrah Pinot Noir and Chardonnay) particularly benefit when treated with it.